A number of upgrades and modifications have been made to ScotBlogs to better prepare our bloggers for 2011. We’ve made theme enhancements to support new features in WordPress 3, added mobile support for readers/editors and the ability to generate thumbnails for use in a post. A new theme was created to support new features introduced with wordpress 3. “Wooster 2011” is based on the same ScotBlogs design, but has added support for custom menus and headers. These features are available under “Appearance” after activating “Wooster 2011” on your blog. Custom menus can be used as your primary navigation or as a widget in your sidebar. There are currently 5 custom header images to choose from, more will be added in the future. At this time we are asking that you do not upload your own images as headers as they will be reverted. Please contact Dwight if you need assistance or have an image you would like to submit for use. ScotBlogs now supports mobile posting from Android, BlackBerry and iOS devices. 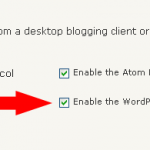 This feature is disabled by default, but the administrator of a blog can enable it by enabling XML-RPC in the Remote Publishing section of Writing Settings (Settings>Writing in the left navigation). In addition to mobile posting, we’ve also added mobile theme support. When a user navigates to ScotBlogs on their mobile device, they are presented with a different look. The same information is shown, but displayed in an interface that is more suitable for a mobile device. The reader has the option to view the site normally by selecting “Exit The Mobile Edition” at the bottom of the page. Until now, editors who wanted to preserve the detail of a full-size image had the choice to insert the image on a new line or behind a link. It is now possible to insert a small image (thumbnail) into a post that links to the full size image when clicked. This allows editors a convenient way to preserve the original image when inserting next to related content. This can be done simply by choosing a size when inserting an image into a post. This entry was posted in Updates and tagged mobile, theme, upgrade. Bookmark the permalink.